Mutism is more commonly related to surgery in the posterior fossa tumor. It may be immediate or delayed. Virtually all cases of mutism occur within the first week of surgery, with 50% occurring within the first 2 days. Overwhelmingly, mutism of cerebellar origin has been reported following surgical interventions in the posterior fossa for tumors. However, there are other etiologies reported in the literature, including posterior fossa trauma, cerebellitis (inflammation of the cerebellum), cerebellar hemorrhage, embolic event and arterio-venous malformations. However, epidermoid cysts of the quadrigeminal cistern presenting with mutism are not known. We report a rare case of quadrigeminal cistern epidermoid with mutism. The causes, mechanism, pathophysiology, and management of such cases are discussed here. A 16-year-old female presented to us with a 10-month history of headache of mild to moderate severity. She gave history of occasional vomiting during the previous months. Her parents revealed that their daughter was failing to speak anything for the last 6 months. On examination, the child was fully conscious, following simple commands but not verbalizing at all, but she was able to gesticulate for most of the queries. She had upward gaze paresis with normal insight and reaction. Otherwise, the rest of the ocular movements remained unrestricted. Fundi showed mild papilloedema. Her routine investigations remained within normal limits. A magnetic resonance imaging image revealed a large homogeneously hypointense mass on the T1-weighted images, which was hyperintense on the T2-weighted image to occupy an entire quadrigeminal cistern [Figure 1]. It was a very large mass, expanding the cistern with extension into the supracerebellar cistern. It was almost compressing the entire third ventricle anteriorly and also the splenium as well as the posterior half of the corpus callosum superiorly. It was causing a mass effect over the upper part of the midbrain. Considering the diagnosis of quadrigeminal cistern epidermoid, the patient was planned for surgery via an infratentorial and supracerebellar approach. During surgery, the epidermoid was encountered in the supracerebellar cistern itself. The epidermoid was encircling the vessels of the cistern, i.e. vein of Galen, basal veins of Rosenthal and posterior part of the internal cerebral veins. The entire pearly material of the epidermoid was delivered from all the sites gradually, leaving the thin capsule behind at places [Figure 2]. A large cavity was created and cerebrospinal fluid (CSF) started pouring in from the posterior third ventricle. Once the quadrigeminal cistern became clear, a ventricular catheter was left in the cavity and the wound was closed as per the standard norms. The patient was extubated following surgery. It was very surprising to note that the patient started verbalizing immediately after complete recovery from anesthesia. The ventricular drain was taken out after 24 h as the CSF drained was clear. She made an uneventful recovery without any neurological deficit. She was discharged on the 7 th postoperative day. The patient was continued on steroids for the next 2 weeks in order to take care of chemical meningitis. At the follow-up of 6 months, the girl was perfectly well. There are numerous case reports of mutism in the literature. In a report, a 14-year-old girl with epidermoid cyst in the 3 rd ventricle manifested mutism. The cyst was tapped three times and, after each tapping, the patient improved, but after a few days the symptoms recurred. Therefore, excision of cyst was performed. Postoperatively, in the first week, her speech was mainly limited to yes or no. On discharge from the hospital after 8 weeks of operation, she was still drowsy. At the 8-month follow-up, there was no mutism, but she was forgetful, and at times incontinent to urine. Meanwhile, during the course of her illness, there were symptoms of raised intracranial pressure (ICP). Her symptoms could be related to the direct pressure on the diencephalon level, with involvement of the hypothalamic-thalamic communication, with impairment of the afferent impulse. In our case, the cyst was located in the quadrigeminal cistern, and improvement was dramatic. This signifies the importance of some anatomical substrate responsible for mutism in close vicinity of the quadrigeminal cistern. Transient mutism has been reported in three cases following removal of the lateral and third ventricular mass following a transcallosal approach. Mutism may be a result of division of the corpus callosum in such cases. Suppression of the limbic system caused by a lesion in the anterior cingulate gyrus, septum pellucidum, fornix, supplementary motor cortex, thalamus and basal ganglion may be responsible for reduced speech production. Jonathan reported two patients, each of whom developed cerebellar mutism after tumor resection, using a posterior fossa approach. The first patient underwent gross total resection of a pineal region tumor via a supracerebellar approach. The second patient underwent posterior fossa decompression for a left cerebellar hemispheric renal cell carcinoma metastasis with adjacent hemorrhage. One patient displayed a variant of cerebellar mutism with severe ataxic dysarthria without complete absence of speech, whereas the other demonstrated frank mutism. After neuroimaging studies confirmed the absence of a surgically treatable postoperative cause for the patients' symptoms, they were managed in a supportive fashion (e.g., speech therapy) and improved within 3.5 months and 1 year, respectively. Forty-six cases of cerebellar mutism with mean age ΁10.4 years following posterior cranial fossa surgery were studied. The pathological lesions were medulloblastomas in 33, astrocytomas in seven, ependymomas in four, metastases tumor in one and arteriovenous malformation in one. 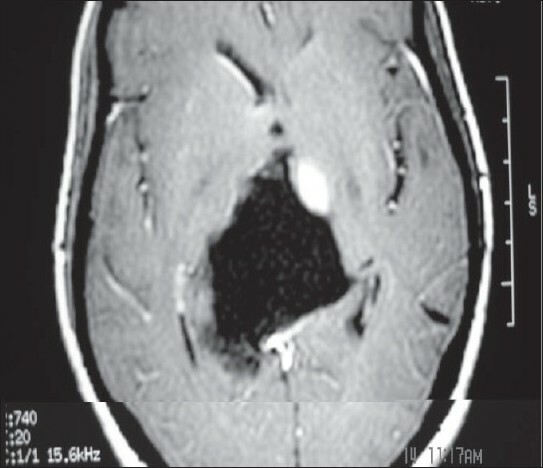 All mass lesions were considered to be large or very large. The latency for the development of mutism in these cases lasted from 4 days to 4 months (mean 6.8 weeks). Dysarthric speech ensued after the mutism was resolved in 35 of 46 patients. The mutism was transient in all the cases. Mutism is a well known event after surgical intervention of tumors of the posterior fossa. This event is thought to be more evident in cases of tumors in which the brain stem is in some way mistreated during surgery, but it is clear that this type of mutism is speech disturbance, a motor disorder in which the cerebellum temporarily loses its capacity to poke the phonic nuclei function efficaciously to the point of anorthia and mutism. However, there are other types of mutism, which are language alterations secondary to cerebellum lesions. It seems probable that cerebellar mutism (secondary to posterior fossa involvement) is relatively different in relation to supratentorial mutism. The structures involved in both of these may vary. It seems probable that the anatomical substrate for mutism lies in close vicinity to the quadrigeminal cistern, which may be either reticular formation of midbrain, fornices, thalami or corpus callosum. However, the possibility of bilateral involvement of these paired anatomical structures cannot be denied. Compression of the midbrain may also be responsible for such an event. 1. Kallmes DF, Provenzale JM, Cloft HJ, McClendon RE. Typical and atypical MR imaging features of intracranial epidermoid tumors. AJR Am J Roentgenol 1997;169:883-7. 2. Iaconetta G, Carvalho GA, Vorkapic P, Samii M. Intracerebral epidermoid tumor: A case report and review of the literature. Surg Neurol 2001;55:218-22. 3. Yoshizato K, Kai Y, Kuratsu J, Ushio Y. Intramedullary epidermoid cyst in the Brain stem: Case report. Surg Neurol 1996;45:537-40. 4. Osborn AG, Preece MT. Intracranial cysts: Radiologic-pathologic correlation and imaging approach. Radiology 2006;239:650-64. 5. Tancredi A, Fiume D, Gazzeri G. Epidermoid tumors of the fourth ventricle: Very long follow up in 9 cases and review of the literature. Acta Neurochir (Wien) 2003;145:905-10. 6. Kaido T, Okazaki A, Kurokawa S, Tsukamoto M. Pathogenesis of intraparenchymal epidermoid tumor in the brain: A case report and review of the literature. Surg Neurol 2003;59:211-6. 7. Recinos PF, Roonprapunt C, Jallo GI. Intrinsic brainstem epidermoid tumor: Case report and review of the literature. J Neurosurg 2006;104:285-9. 8. Bhatoe HS, Mukherji JD, Dutta V. Epidermoid tumor of the lateral ventricle. Acta Neurochir (Wien) 2006;148:339-42. 9. Roy K, Bhattacharyya AK, Tripathy P, Bhattacharyya MK, Das B. Intracranial epidermoid: A 10-year study. J India Med Assoc 2008;106:450-3. 10. Benson DF. Aphasia, alexia, and agraphia. New York: Churchill Livingstone Inc; 1979. p. 163-4. 11. Ammirati M, Mirazi S, Samii M. Transient mutism following removal of a cerebellar tumor. Childs Nerv Syst 1989;5:12-4. 12. Ferrante L, Mastronardi L, Acqui M, Fortuna A. Mutism after posterior fossa surgery in children. J Neurosurg 1990;72:959-63. 13. Fraioli B, Guidetti B. Effects of stereo tactic lesions of the dentate nucleus of the cerebellum in Man. Appl Neurophysiol 1975:38:81-90. 14. Humphreys RP. Mutism after posterior fossa tumor surgery. Concepts Pediatr Neurosurg 1989:9:57-64. 15. 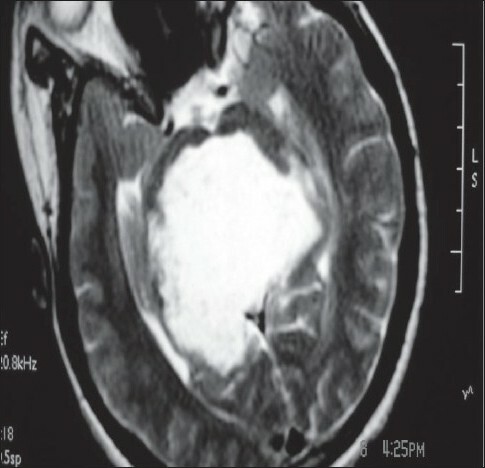 Nagatani K, Waga S, Nagakawa Y. Mutism after removal of a vermian medulloblastoma: Cerebellar mutism. Surg Neurol 1991:36:307-9. 16. Rekate HL, Grubb RL, Aram DM, Hahn JF, Ratcheson RA. Muteness of cerebellar origin. Arch Neurol 1985:42:697-8. 17. Sakai H, Sekino H. Nakamura N. Three cases of cerebelar mutism. Shinkeinaika 1989:12:302-4. 18. Cairns H, Oldfield RC, Pennybacker JB, Whitteridge D. Akinetic mutism with on epidermoid cyst of 3 rd ventricle. Brain 1941;64:273-90. 19. Nakasu Y, Isozumi T, Nioka H, Handa J. Mechanism of mutism following the transcallosal approach to the ventricles. Acta Neurochir (Wien) 1991;110:146-53. 20. Tahta K, Cirak B, Pakdemirli E, Suzer T, Tahta F. Postoperative mutism after removal of an anterior falcine meningioma. J Clin Neurosci 2007;14:793-6. 21. Ozek MM, Necmettin P, Alptekin B. Mutism after total removal of an exophytic pontine glioma. Turk Neurosurg 1993;3:37-9. 22. Guidetti B, Fraioli B. Neurosurgical treatment of spasticity and dyskinesias. Acta Neurochir Suppl 1977:24:27-39. 23. Robertson PL, Muraszko KM, Holmes EJ, Sposto R, Packer RJ, Gajjar A, et al. Incidence and severity of postoperative cerebellar mutism syndrome in children with meddluloblastoma. J Neurosurg Pediatr 2006;105:444-51. 24. Sherman JH, Sheehan JP, Elias WJ, Jane JA Sr. Cerebellar mutism in adults after posterior fossa surgery: A report of 2 cases. Surg Neurol 2005;63:476-9. 25. Ferrante L, Mastronardi L, Acqui M, Fortuna A. Mutism after posterior fossa surgery in children: Report of three cases. J Neurosurg 1990;72:959-63. 26. Erώahin Y, Mutluer S, Caπli S, Duman Y. Cerebellar Mutism: Report of seven cases and review of the Literature. Neurosurgery 1996;38:60-6. 27. Di Rocco C. Pediatric Neurosurgery. Cereb Astrocytomas 1999;21:427-59. 28. Catsman-Berrevoets CE, van Dongen HR, Zwetsloot CP. Transient loss of speech followed by dysarthria after removal of posterior fossa tumor. Dev Med Child Neurol 1992;34:1102-9. Nair, P. and Sahu, R.N. and Kumar, R. and Behari, S. and Nair, A.P. and Srivastava, A.K. Behari, S., Jaiswal, S., Nair, P., Garg, P., Jaiswal, A.K.